RockUnitedReviews: AREA51: "Judge The Joker"
Japan. Nippon. Why everything ever so slightly connected to the place is considered as fascinating and fun? First of all. Hardly everything about the land of the rising sun is fun. Stereo-types and all that. But I honestly believe that we love Japan because it's so different from the rest of us. That's it. Plain and simple. It's different. Unique. The mythical place with its own tradition and rules. Thus why I can't get enough listening to Kate Cain on the latest Area51 album. Not a single word in the English language and merely the song title give us the hint of what she's singing about. Nonetheless. Yours truly end up in awe of the angelic voice and rock solid performance. 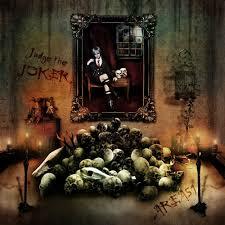 "Judge The Joker" is the fourth album by the band/duo and its overall leader, the highly technical guitarist, Yoichiro Ishino. He's the instructor of the guitar department of Japan's Musician Institute (MI) and has worked with Eizo Sakomoto (Anthem) on his solo albums. Guest musicians are drummer Dirk Verbeuren (Soilwork), bassist Mike Lepond (Symphony X) and keyboardist Matt Guillory (James Lebrie /Dream Theatre). Previous albums feature guest musicians such as Rob Rock (Impellitteri) and their latest effort has once again been mastered by Jens Bogren (Opeth, Symphony X, etc). The arrangements and compositions? Ultra melodic and frankly just catchy Neo-Classical rock! Bags of attitude and flashy guitar work and perhaps the Swedish touch of guitarists and acts such as Nation, Glory, and of course Yngwie J Malmsteen. The Vampire's Agony, Over The Rainbow, Falsa Luce, Call My Name, The Devil's Own, etc. are all top notch songs with marvelous drive, flow, and classy fretwork. Cinematic indeed and the great mix of neo-classical and the soundtrack of your video game. Recommended.